Info "Pull the string and plug your ears!" 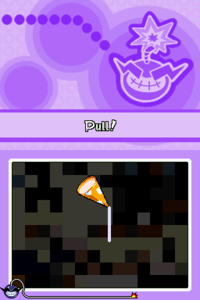 Blowin' Up is a microgame found in the Cute Cuts stage in WarioWare: Touched! When starting the microgame, the message Pull! will appear on the screen. The objective of the game is to pull the strings, using the DS Stylus, to reveal the surprise. 1st level difficulty: The player must pull down 1 string. The scene is a child's birthday when finished. 2nd level difficulty: The player must pull down 2 strings. There is a wedding scene when finished. 3rd level difficulty: The player must pull down 3 strings. There is a Halloween scene when finished. Blowin' Up also appears as a microgame in Super Smash Bros. Brawl, Super Smash Bros. for Nintendo 3DS, and Super Smash Bros. Ultimate in the WarioWare, Inc. stage. In these games, when starting the microgame, the messsage Pop! will appear rather than Pull!, and instead of pulling the strings, the players have to attack them to pop them. The player(s) that popped all the strings will win the microgame and will be awarded with a Super Mushroom, invincibility, etc. This page was last edited on November 4, 2018, at 20:17.